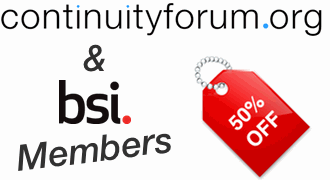 BSI and the Continuity Forum bring you the Risk and Resilience Conference 2014. Organisations across business and public sectors need to understand how in world of dynamic and fast moving risks they can improve the effectiveness of their risk and resilience management. This conference aims to connect Risk Management and Resilience far more deeply into organisational thinking and build the business case for better and more effective action. This special one day conference brings together very senior government figures, industry thought leaders and those at the very forefront of standards development to share their knowledge and vision of how Risk and Resilience are central to business success. If you can only attend one event this year this is the one! The Risk and Resilience Conference will highlight how Risk, Continuity and Resilience professionals can meet and overcome the challenges facing business and add value to their organisations performance. Risk Management has made the world safer. Standards such as ISO 31000 and ISO 22301 provide a structured management system that provides an excellent overview of risk management and the structures needed to identify the important risks and mitigate their effects and thereby directly contributing to the performance of the organisation. Hear from Howard Kerr, Chief Executive of the BSI on how Standards can be the tools for better regualtion and business performance. Get the about latest thinking on risk management trends and the key issues and how they will affect you and your organisation from Julia Graham, President of FERMA, Dr Robert MacFarlane, Cabinet Office, Steve Fowler, IRM, Tony Grayling, Environment Agency and Prof. Dr Bruno Bruhwiler, ISO 262 Convenor. Understand why climate risk is an important priority and find out what you can do in your business through the new Smart Guide to Climate Adaptation. Hear about the rapidly developing changing landscape of Cyber Risks and what we can do to control them from world class experts. Understand more about "Cyber Risk Standards", how these will affect your business and what this means for your IT and Risk Management. Discover why risk management is moving towards performance management and what this means for your organisation. Examine the relationship between Business Continuity, Risk Management & Resilience and why the alignment between governance, compliance and risk must be considered if our organisations are to become more resilient. Determine what the commons to real performance are and discover the Road to Resilience. Discuss with our experts the changing face of Risk and Resilience Management. This conference is designed to help you continue the development of professional skills and insight, enhance the capabilities of organisations and deliver real value through world class thought leadership. In addition, you will gain deeper knowledge about the positive role standards can have and how their implementation could benefit your business to become more resilient. You will obtain first-hand information about the forthcoming ISO 31000 revision and the new BS 65000 for Organizational Resilience as well as having plenty of opportunity to get involved and network with the experts and peers. IMPORTANT NOTE - Continuity Forum Members must contact us directly to receive your priority booking code and discount. Please email us HERE or call +44 (0) 208 993 1599. FOR MORE INFORMATION you can also call either the Continuity Forum on +44 (0) 208 993 1599 or, the BSI on +44 (0) 208 996 6412. Sponsorship and exhibition opportunities are available for this event enabling you to meet and engage with high-level delegates and industry experts For more information on the packages available and how you can benefit please contact us HERE! The programme although confirmed is subject to speaker availability. Philip Coley - "The Risk Landscape"
How experience is changing the our understanding.